As I had said, I told Cat they were going to win today for her birthday, and they did! And boy did they win! Final score? Seventeen to four. And it was a CRAZY game. Again, since I’m unemployed, I got to the stadium a little after four. While I was waiting for the gate to open, I started working on two Wolf shirts for my friend’s two daughters who are going to the game with me on Thursday. Randy Wolf has become one of their favorites, since he signed a ball for Natalie’s birthday gift (he even personalized it!). Julia (the older of the two) saw my Wolf shirt I made (copied from the original my friend Maria made for me) and said she wanted one. I told her I would make her one. Well, since they’re going to the game with me on Thursday and Wolf is the probable starting pitcher… figured now is the best time to make her that shirt. And I couldn’t make Julia a shirt without making one for Natalie. Then these two guys were walking up. They asked me about the game, where they could buy tickets and stuff. I probably gave the too much information like I usually do. When it was almost time for the gate to open, I started packing my things up. That’s when I realized I couldn’t find my phone. Took me about five minutes or so to realize, my phone was sitting on my dashboard. Duh! Gates opened, and I was walking in when I overhead a guy behind me talking. I started talking to him. He didn’t know you could go into the field level for batting practice and then take the elevator up to your level. I told him to stick with me. He later commented on all the people I stopped to say hi and talk to. Oddly enough, the Dodgers weren’t taking batting practice. He said they didn’t take batting practice yesterday either. There were a few Dodgers out warming up and stretching. Cat came down and gave me a copy of the Dodger magazine. I was flipping through it, mainly looking for Erika’s nephew. He’s supposed to be in one of the upcoming Dodger magazines. He was dressed like Manny the first home-game after Manny’s suspension was over. Wouldn’t you know it? I didn’t find him but I did find this .. ME!!!! I was in shock. Not a flattering picture, but still. 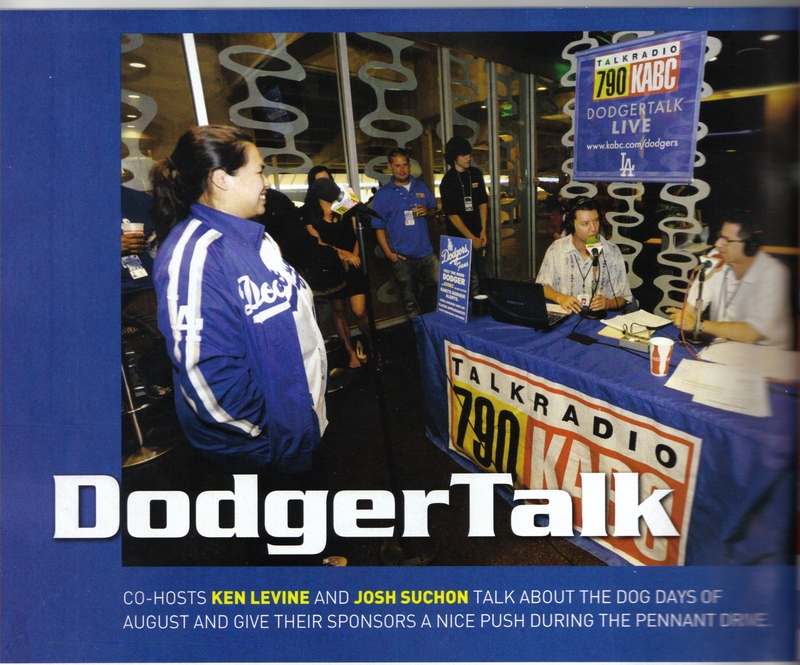 I was in the Dodger magazine!!! After batting practice was over, I headed up to my seat. I purchased this as part of my twelve-game mini-plan. 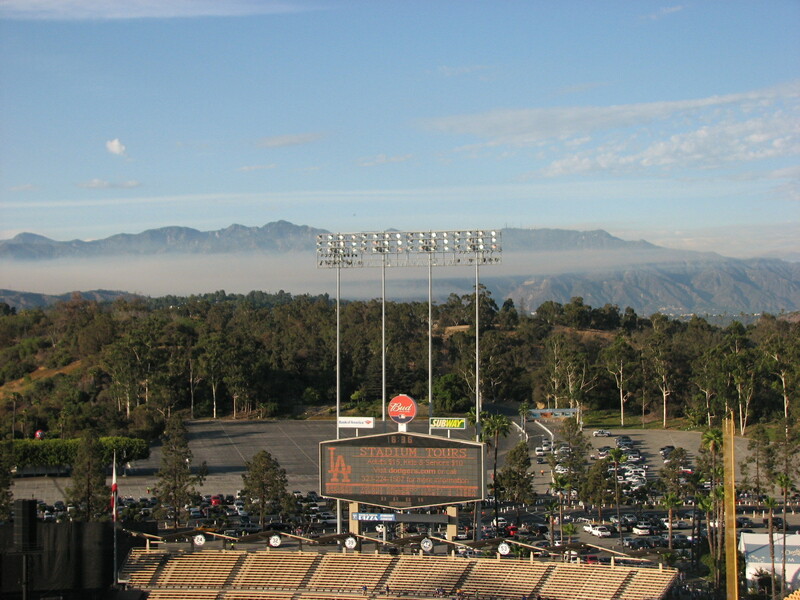 When I got up there, I noticed this cloud layer that I realized … that’s the smoke from the fire that’s off the 134 freeway! The game started off well enough. Kuroda struck out the first two batters, and before you knew it, it was the Dodgers turn to bat. The Dodgers came close to batting around the in first inning. By the time the second inning began. Kuroda had a very nice lead to go with. 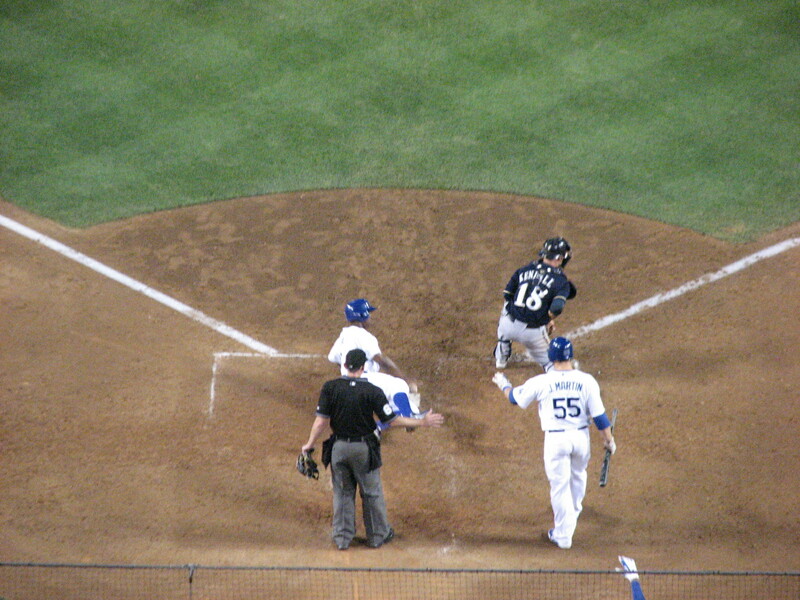 Matt Kemp making a beautiful slide to score! Unfortunately, Kuroda got disctracted when a fan decided to make a dumb move and sprint onto the field. He waved to Manny as he passed him too! The security eventually caught up with him. Great job by security! Especially since I know two of the guys who tackled him. The two who had to run back to their regular spots once the guy was carted off. Game resumed … and the Brewers got on board with three runs! Uh-oh, that means… we’re only up by one run! That’s okay, because the Dodgers exploded for a couple more runs! Okay, more than a couple since my friends like to correct me when I say “couple” because it was more than “two” runs. It was quite a bit of runs. Manny and Matt both hit homers. Juan Pierre even got in on the action with a walk and HBP. 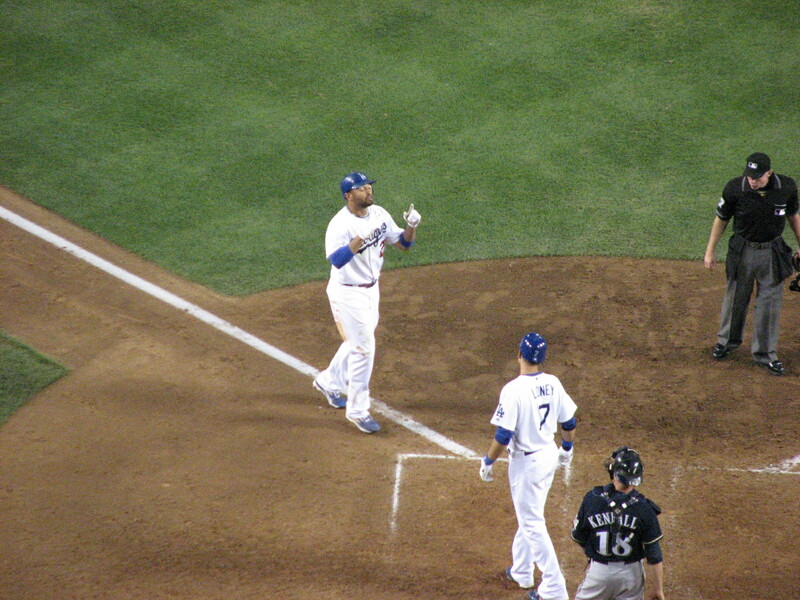 Matt celebrating after him home run. Juan Pierre sliding in to score. 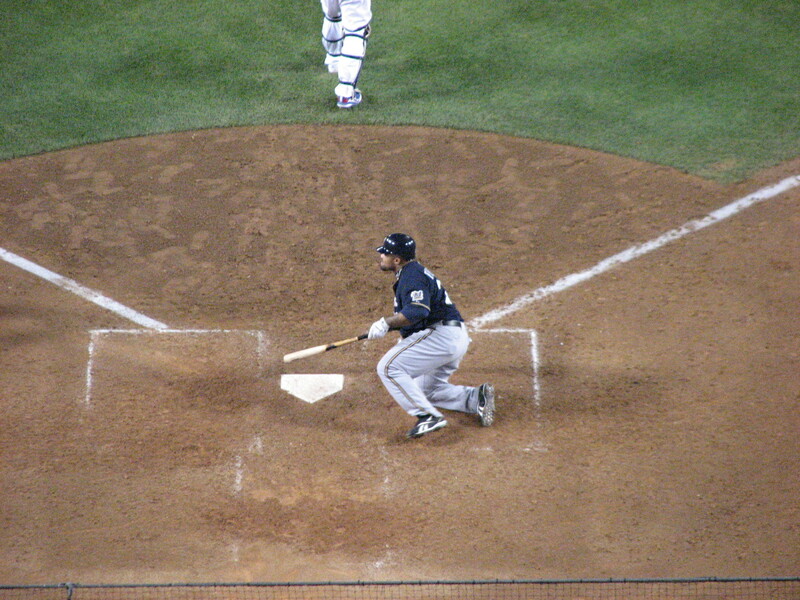 In the top of the ninth inning, Guillermo Mota hit Prince Fielder with a pitch. Mota was immediately ejected. That was the fourth hit batter of the night. 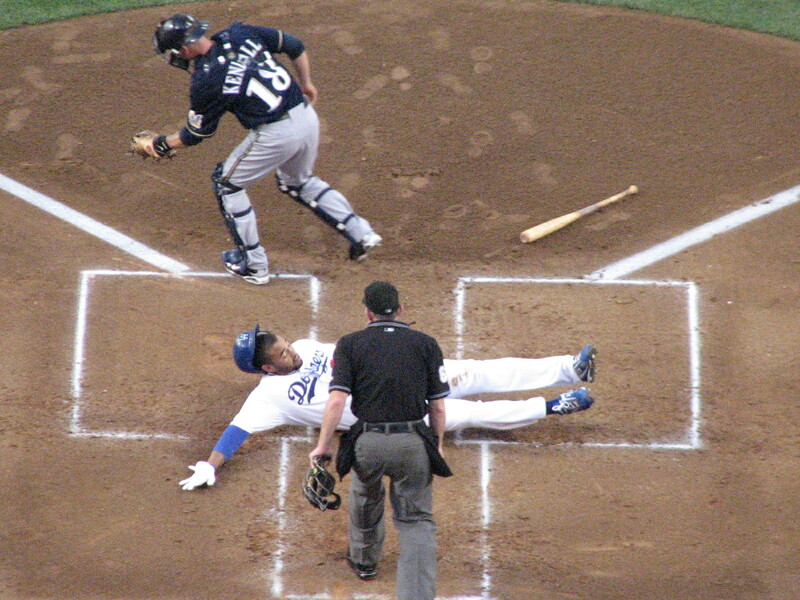 Ramirez and Pierre were hit; Catalanotto and Fielder were the other two. 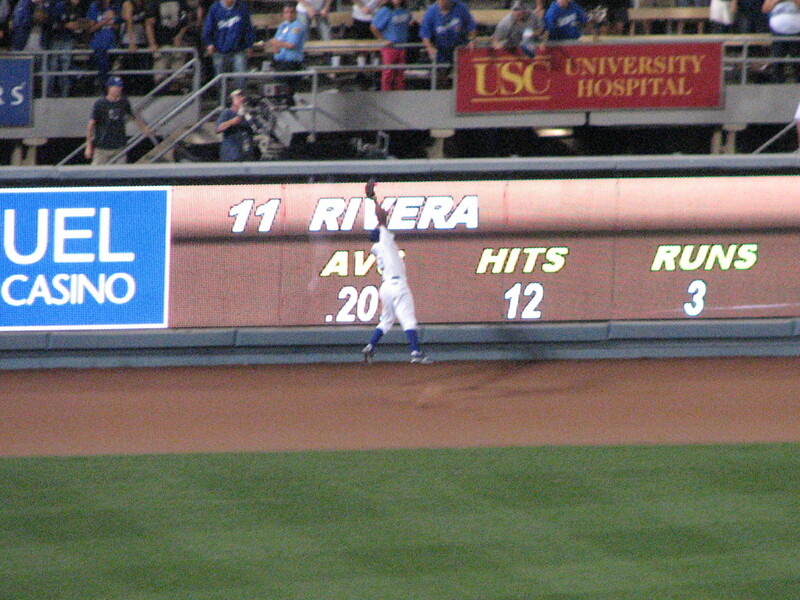 Juan made the last catch of the game. I was talking with the people in front of me when I saw Juan (the security guy) run down the stairs that are next to the Dodgers’ dugout. The other security guards were soon to follow. When I looked around, only two other security guys were actually on the field. 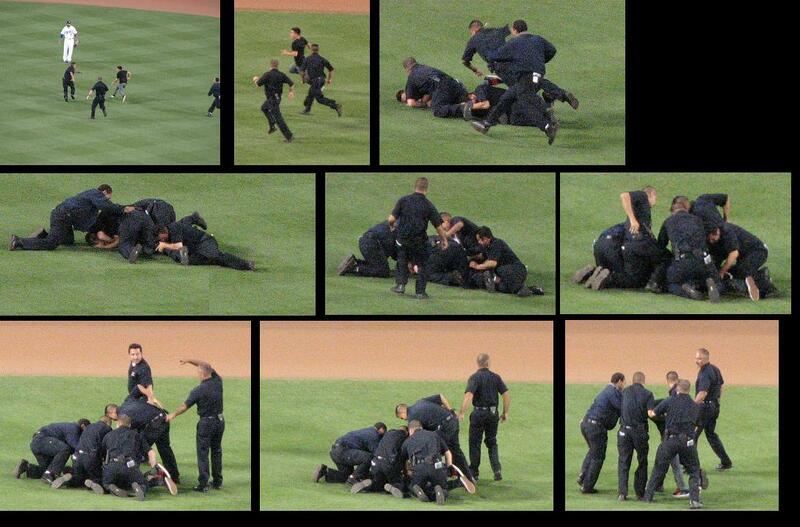 If anyone wanted to run on the field, that would’ve been a good time. All the other security officials were too busy trying to stop Prince Fielder from entering the Dodgers’ clubhouse. I knew something was going on. But I didn’t know until I got into the car and turned on Dodger Talk. Thank you Kenny and Josh! What a crazy series! Wonder what tomorrow holds. Probably won’t be seeing as many hit batters, that’s for sure! d. Probably. But I didn’t hear anyone else calling out to him. What an interesting series this one has been so far against the Brewers. First there was Monday’s game, where Clayton Kershaw, the only player to have gotten into L.A. at a decent hour walked four batters straight! On top of that, the Dodgers offense didn’t spark until the ninth inning, coming within a hair of winning. I originally didn’t intend on going to this game. But Cat texted me during the day, asking where I was going to sit. I told her, either in front of the TV or my computer, I didn’t know yet. She thought I was going to the game. She said she had an extra ticket and I could use it if I wanted to. I had to think about it because I was meeting a friend to go over what needed to be done while I cat/house sat for her. We worked it out that I met Cat before the gates opened to get the ticket. I am now officially unemployed. So I’ve got lots of time on my hands before school starts. Everyone keeps telling me to apply for a position at Dodger Stadium. 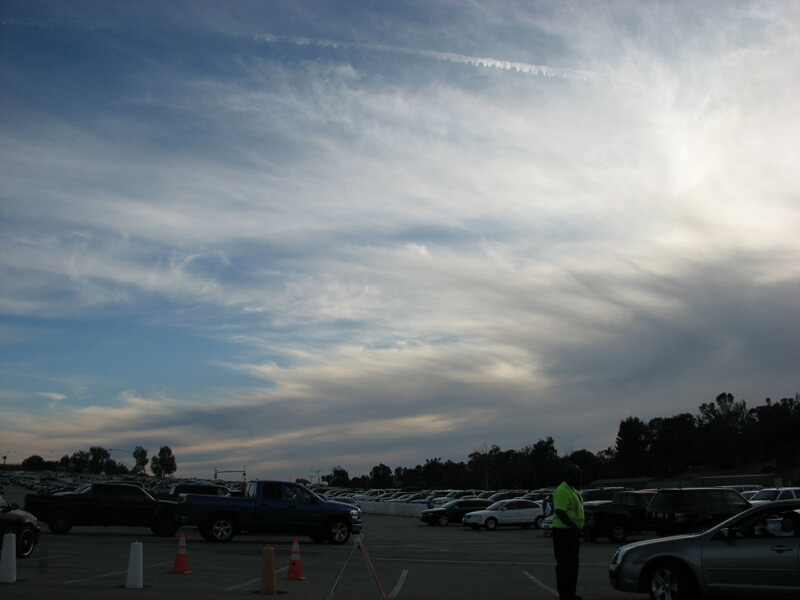 When I got back to Dodger Stadium, I circled around a little bit, trying to find a parking spot. A guy asked me if I was looking for a spot. He was leaving. It took me a few minutes to park, since he was the last car before the red zone. I wanted to make sure there was plenty of space. I made it by the hair of my chinny chin chin. I got to my seat before the first pitch. I got to the stadium in the middle of the National Anthem. After I walked in, I stopped since the National Anthem was going on. No disrespect, but whoever was singing it, it felt like it was never going to end. Beautiful scenery as I was walking in. 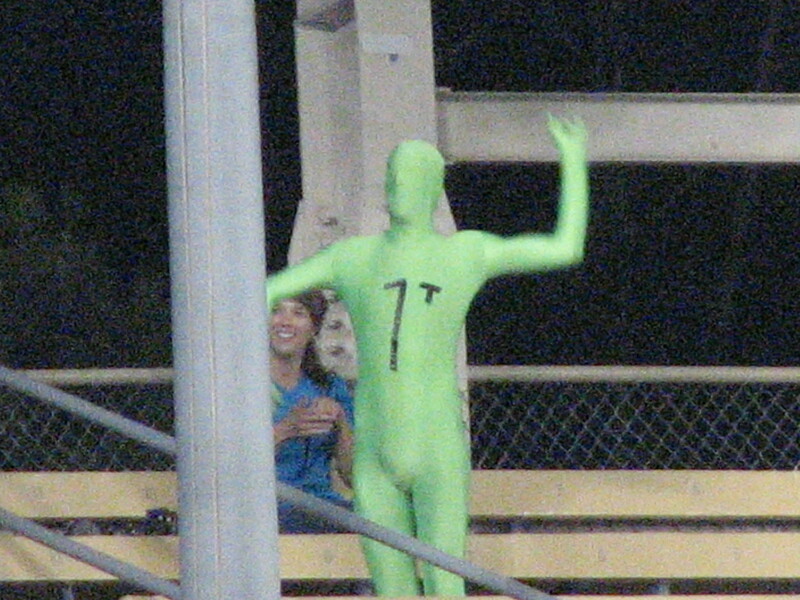 Creature in Right Field Pavilion. The first couple innings crept by. I got to chat mostly with the people in the row behind me. They drove in from Fresno. The usher handed one of the kids a little photo of Blake DeWitt. He didn’t know who Blake is. So I explained to him that Blake DeWitt is our YoYo. He’s down in AAA right now, but you never know when he’s going to get called back up. The Creature stirred up the crowd for a little bit. He was asked by security to remove his suit, since masks covering your faces are not permitted. I guessed that was the reason why, and that was the reason Ken was giving on the post game Dodger Talk. I figured. After all, I know the rule quite well since I bring my Wolf hat to every Wolf game. The crowd booed when the Creature was escorted out of the Pavilion. However, Ken insisted that he was not ejected. I told Cat that the Dodgers were going to win the next day, since it was her birthday. She asked me not to say anything to anyone. But since she posted it on her blog, it should be okay? Right?